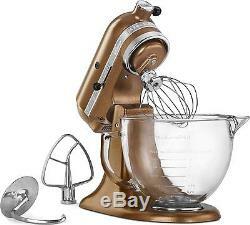 Artisan® Design Series 5-Quart Tilt-Head Stand Mixer with Glass Bowl. The KitchenAid® Artisan® Design Series Stand Mixer KSM155GBQC adds radiance to any kitchen with a premium metallic finish and elegant 5-Quart glass mixing bowl. With 10 speeds, easily make your favorite recipes. Make your culinary efforts even more brilliant with a countertop appliance that mixes, kneads and whips ingredients together with ease. Turns your stand mixer into a culinary center. With more than 15 optional attachments use the power of your stand mixer to help you make fusilli pasta from scratch, shred a block of parmesan cheese in seconds and so much more. Allows clear access to the bowl and attached beater or accessory, so you can easily add ingredients for a recipe. Locking the head into place during operation keeps the beater-to-bowl contact close and efficient. Powerful enough for nearly any task or recipe, whether youre stirring we and dry ingredients together, kneading bread dough or whipping cream. 5-Quart (2,37 L) Glass Bowl with Measurement Markings. 5-quart glass bowl with measurement markings adds an extra touch of elegance to your kitchen. The glass bowl features a convenient pouring spout and easy-to-read, graduated measurement markings. Burnished metal flat beater, burnished metal dough hook and 6-wire whip. The item "Kitchenaid KSM155GBQC 5Quart Tilt Head Stand Mixer Glass Bowl" is in sale since Friday, December 16, 2016. 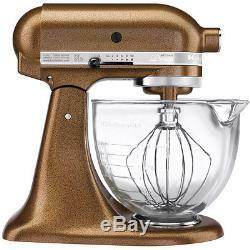 This item is in the category "Home & Garden\Kitchen, Dining & Bar\Small Kitchen Appliances\Countertop Mixers".central" and is located in Lachine. This item can be shipped to Canada, United States.